Rumors about a new CB1000R have been around for a long time and a release for next season is now considered safe. Now the rumors are gathering that it becomes a kind of Cafe Racer. What speaks for or against it and how it will look like you see here. The Neo Sports Cafe project was announced in a teaser. So there will definitely be a Cafe Racer from Honda. New technology in a nostalgic look. Meanwhile, there is a second teaser and it looks like this is the coming Honda CB1000R. It probably gets the addition ExMotion. N.S.C Project – Teaser analysis what do you get to see? Let’s take a closer look at the trailers. The first trailer does not show much. A very schematic silhouette is shown. After that, one sees mainly development and design work. At the end you can see the front with blinkers and round headlights. First, too dark to recognize Accurate- and then to light when the headlights is on. The second trailer shows something more. Liquid metal, the designation HD2BS and some equipment suggest aluminum die-casting processing. The silhouette is now clearer to see and the Cafe Racer style so well recognizable. Afterwards, you can see several different montages which tell us something more. The Cafe Racer is driven by a four-cylinder engine. The round headlight uses LED technology. The displays seem to be split – into a round instrument, presumably an analogue speedometer, and an elongated, probably digital, tachometer. The rear muffler is attached to the side, so the buckle under the stern should be the taillight. There is a footrest for the passenger above the rear muffler, so it will not be a single seat. A single swingarm is installed and the number plate holder attached to it. The rear thereby remains clean. The motorcycle is manufactured at KumaMoto. This is Honda’s largest domestic location. There, one is in a position to realize the complete development and manufacturing process, including serial production. The display “New Machine” or the title “A new breed is born: Neo Sports Café by Honda” suggests a completely new model. This is possible, of course, but not necessarily. If you remember a few years back then you come to the concept bike CB4. The similarity to the N.S.C project is already extreme. The same silhouette, round headlights, single swingarm, exhaust at the side – a bit changed, the license plate attached to the swingarm, the light under the rear – everything very very similar – albeit not in the last detail. 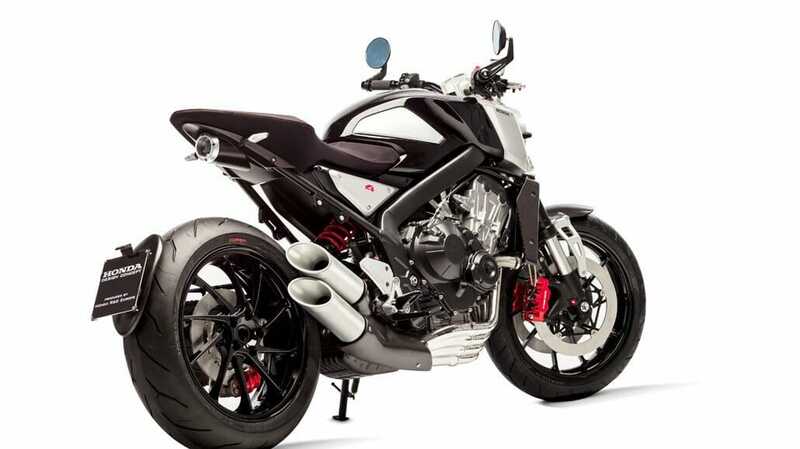 So you could guess now that the CB4 Concept is now simply built and so it is not the CB1000R. To get to the bottom, we have to take a look at the Asian market. Recently, I introduced the Honda CB150R. In the side view you can see some similarity, even if the 150er is somewhat depressed or even shorter. The number plate holder is different, the taillight is also missing, the single swingarm and so on. However, if you look at the front, you can see the similarity to the Neo Sports Cafe project. The headlight is at least similar, the direction indicators are absolutely identical, even if placed somewhat different, and the basic shape of the handlebar agrees here. Overall, you can see a clear relationship between the small CB150R and the N.S.C project. If you look at an older model (the CB150R not comes to the European market) you can see immediately that this is a small version of the old CB1000R. – And so we are now getting the bow to the upcoming Honda CB1000R ExMotion. If the little sister of the old CB1000R has developed into a Cafe Racer, the new CB1000R would have to develop accordingly. Why the addition ExMotion? The new CB150R has this addition and stands for Life in Exiting Motion. We will find out exactly what is going to happen on 6th November, because it will be presented officially. All the news you can find here again.